The Nordic welfare state, the tripartite model, the social stability and trade unions all came in for a lot of praise during the conference, held in the old Posthuset in Stockholm city centre. Politicians, trade unions, employers and also the representatives from the OECD and the ILO waxed lyrical. When Google also joined in on the praise, it is unclear whether this could be seen as unexpected or simply smart? Google is preparing to cooperate with the Nordic countries, which researchers and statistics say belong in the avantgarde when it comes to digital development and positive attitudes to automation. Or is it a strategic step for the company, in order to gain valuable knowledge about the thinking in the Nordic region? Google’s representative Iarla Flynn told the conference how Google wishes to reach out with its knowledge to society as a whole, and how the company believes in the sharing of information and in openness. Google has launched a cooperation project with municipalities and authorities like the Swedish Public Employment Service, where the company takes part in the planning of courses aimed at improving job seekers’ digital skills. Flynn was clear about the fact that Google employs many people in the Nordic region because the countries belong to the digital vanguard. How is new technology introduced? Iarla Flynn also talked about the fact that many of the new jobs which might soon become more common are linked to teaching new AI robots how to perform their tasks, as well as training company staff in how to use the new technology. Juha Antila from the Central Organisation of Finnish Trade Unions, SAK, also participated at the conference on the Future of Work. He wanted to focus on an issue which he felt did not get enough attention at the conference. “The organisational culture in a workplace and how much influence staff are allowed is absolutely crucial when introducing new technology. If there is open dialogue between management and workers and if the workers are allowed to share in the decision-making process when new technology is introduced, the workplace will succeed. If everything is top-down you run a great risk of creating problems when staring to use new technology,” says Juha Antila. SAK last year began a four-year long project called ‘Time of Opportunities’, which focusses on changes to working life. Part of the project will gather facts on how workers within different trades look at automation and AI. Antila considers the new technology to be a fairly undramatic, or even neutral, factor. There are, however, plenty of examples in Finnish workplaces where employees have experienced technical innovation to be both difficult and awkward. Within certain trades there is also a feeling that new innovations are only introduced to increase the control over employees, and that machines are mostly keeping tabs on workers’ efficiency. At the Nordic conference on the Future of Work, Google’s representative Iarla Flynn also talked about how the company wants to work together with trade unions. With Silicon Valley companies’ long-running aversion to trade unions in mind, this attitude could be viewed as something of a turning point. Flynn wants to establish a dialogue with the trade unions, but he also wants to bring them together with other companies, especially technology industry companies. “We simply want to create a conversation about what impact technology can have, what are the questions that should be clarified. We are very optimistic about this, and have had signals from the trade unions that they are positive to entering into a dialogue,” Flynn tells the NLJ. The Swedish Trade Union Confederation, the Swedish Confederation of Professional Associations (Saco) and the Swedish Association of Graduate Engineers told the NLJ they had yet to get an invite from Google. Finnish SAK, however, had a meeting scheduled. “We are actually meeting Google’s people tomorrow, on their initiative (the day after the interview). But my colleague was the one organising the meeting, so I don’t know what we are going to talk about,” says SAK’s Juha Antila. Ulrika Lindstrand, President of the Swedish Association of Graduate Engineers, thinks Google’s strategy of actively working with different actors in society is very interesting. 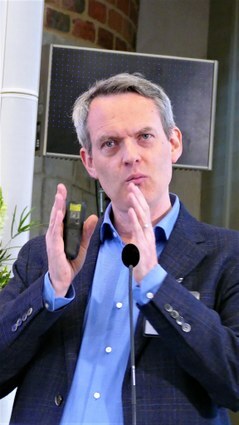 Lindstrand thinks a possible cooperation with Google could benefit the engineering union, if the members could take part in the company’s training programmes. What are the risks of a cooperation with Google? “The greatest risk I see is that a few companies might achieve a monopoly-like position in the marketplace. And when a company gets a monopoly and access to large amounts of data, we are entering a very sensitive area. They have vast amounts of information, so it becomes very important to protect personal integrity, and people cooperating with Google must be allowed to see how the company works. We have to know who owns the data, and that all the information is being used in a way we can accept. In cooperation with the Public Employment Service in Sweden and in several other countries, Google has established free courses ranging from digital everyday knowledge and digital marketing to programming and soft skills. At Jakobsbergsgatan 34 in Stockholm there is a temporary lecture room. In the picture at the top Tjejer Kodar (Girls Codes) hold an inspiration lecture. One of the practical exercises was learning how to make a webpage with cat videos. According to Google, 85 per cent of those who have completed such education in Finland received jobs afterwards. At the reception, Armand Parhizkar and Pernilla Friari are in charge, helping to book personal counseling opportunities with Google's digital coaches.